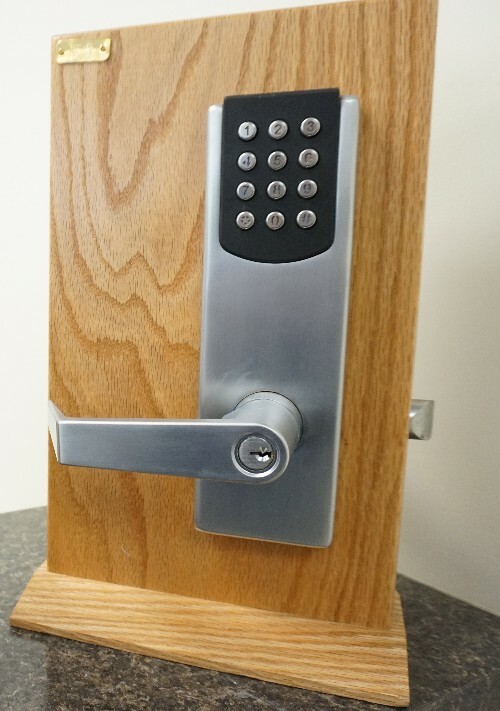 Keypads can provide keyless entry to any commercial building. Quality Key Locksmithing provides fast service for commercial locksmith needs, including emergency services, for your office, warehouse or retail business in Wichita KS. Many locksmiths focus their services on residential clients, and there’s nothing wrong with that. However, commercial organizations have vastly different locksmithing needs than homeowners do. Because many businesses process large amounts of money each day, security is of the utmost importance. Here at Quality Key Locksmithing in Wichita, KS, we have worked with countless businesses over the years, and we can help yours as well. We offer commercial locksmith services 24 hours a day, including emergency situations when you’re locked out of your business or need to repair an exit panic bar lock, and we also offer mobile locksmith service when you’re on the go. Whether you need duplicate keys made for your managerial staff or would like to install panic devices to alert the authorities in case of a robbery, we can help. We can also provide security locks, alarm systems, deadbolts and other security measures. At the more basic level, we offer key duplication, lock rekeying, lock repair and other common locksmith services as well. Whatever your business needs, we are the commercial locksmith to provide it. Security is critical for any business, and you can count on us to do everything in our power to preserve yours. All of our locksmiths are certified and registered, giving you confidence that you have chosen a reputable, honest organization for your commercial locksmith needs. Our insurance policy will cover you in the unlikely event of any damage to your business facility as a result of our work. Of course, we take care to do our job safely and accurately, but it can give you peace of mind to know that you are protected just in case something doesn’t go quite right. We are the ‘cheap locksmith’ to call when you need the following services to make sure you can always access your business or commercial property. We’re ‘cheap’ because we get it done right, the first time. This means you won’t waste time and money when you call us. As a business owner or operator, it can be difficult to find time to go to a locksmith, especially when you are working hard to keep your business as successful as possible. When you work with us, you won’t have to worry about having to leave your business, as we provide mobile locksmithing services. Our mobile technicians can handle just about any job you throw at us, saving you the time and effort of coming into our shop. If there is anything you need that is beyond our mobile capabilities, we’ll do everything possible to make your shop visit as quick and easy as possible. Don’t try to install or fix your own panic bars or exit devices, as they’re subject to the OSHA regulations and tricky to install. Especially if you buy a multi-point, mortice or concealed exit device. These more complex panic bars requires expertise in the field. Let us install or fix your panics in record time. Many commercial facilities rely on keyless entry systems. High-tech fingerprint scanners and outdoor keypads required a specialized expertise to fix and replace. When you want to rekey locks so that all your doors open with a master key, the lock has to be taken apart and reassembled correctly, then the pins are removed and replaced to match the cuts and grooves in the new key. A keypad lock has a keypad to gain access to the building without having a key. The hardware can become faulty and is fairly tricky to figure. Let us do the hard work to replace them. We are familiar with all locking mechanisms, from the classic deadbolt lock to modern keyless entry systems. We know the ins and outs of your doors and can manipulate door hardware, hinges, levers pivots and locks, and do whatever it takes to get you back to running your business. That could mean we picklock a door that needs to be rekeyed or create a master key and master lock systems that give you full access to the business without compromising security. Whether you need lock repair or lock installation, our experienced technicians arrive with the tools to do the job and get you back to the rest of your busy day. For all your commercial locksmithing needs, you can count on Quality Key Locksmithing. We are experts at what we do and have vast experience in working with commercial organizations. We understand how your needs differ from our residential customers, and our commercial services reflect those differences. We welcome you to get in touch with us today to learn more about how we can help your business stay as secure as possible while also providing convenience for you and your team. Call today to learn more about our services and get started!